I was VERY lucky to be invited to the launch party of one of Bloomsbury's new books: The Imaginary by A.F. 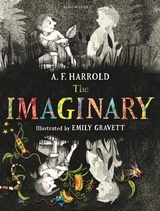 Harrold, illustrated by Emily Gravett. Lizz, the publisher, sent me a copy of the book before the launch (which was yesterday). The Imaginary tells the story of Amanda Shuffleup. Real girl, okay so she's a fictional character but she isn't imaginary like her best friend Rudger. They do everything together. Protect each other (okay so it is more Rudger protecting Amanda but). And stick together. Until one particular day when something terrible separates them. Will Rudger get back to Amanda before he Fades? This book is everything you could want from a book. Sad, funny, happy, a little scary but most of all suspenseful and unexpected. I LOVED it and would recommend it to girls and boys 9 - adult especially to those who like melancholy reads. It was heartwarming, touching and a memorable and brilliant read. Can I forget the illustrations? The detailed and beautiful drawings in this book (illustrated by Emily Gravett) make it one of the most beautiful books I have ever read! And now I have it signed too. Thanks again Lizz from Bloomsbury, I really enjoyed the book.